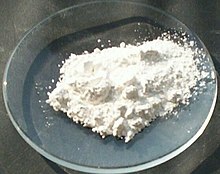 Calcium hydroxide, also known as slaked lime, is a chemical compound with the formula Ca(OH)2. It dissolves slightly in water. It is a base. It can be made by the chloralkali process. It can be dehydrated (remove the water) to calcium oxide by heat. It can be used to neutralize acidic soils. This page was last changed on 7 January 2015, at 03:20.